This article is about the fairy tale. For the Disney film, see The Little Mermaid (1989 film). For other uses, see The Little Mermaid (disambiguation). The Little Mermaid finds the prince's statue under the sea. The Little Mermaid lives in an underwater kingdom with her widowed father (the sea king or Mer-King), her dowager grandmother, and her five older sisters, each of whom had been born one year apart. When a mermaid turns fifteen, she is permitted to swim to the surface for the first time to glimpse the world above, and when the sisters become old enough, each of them visits the upper world one at a time every year. As each returns, the Little Mermaid listens longingly to their various descriptions of the world inhabited by human beings. When the Little Mermaid's turn comes, she rises up to the surface, watches a birthday celebration being held on a ship in honor of a handsome prince, and falls in love with him from a safe distance. A violent storm hits, sinking the ship, and the Little Mermaid saves the prince from drowning. She delivers him unconscious to the shore near a temple. Here, she waits until a young woman from the temple and her ladies in waiting find him. To her dismay, the prince never sees the Little Mermaid or even realizes that it was she who had originally saved his life. After she agrees to the arrangement, the Little Mermaid swims to the surface near the prince's palace and drinks the potion. She is found by the prince, who is mesmerized by her beauty and grace, even though she is mute. Most of all, he likes to see her dance, and she dances for him despite suffering excruciating pain with every step. Soon, the Little Mermaid becomes the prince's favorite companion and accompanies him on many of his outings. When the prince's parents encourage their son to marry the neighboring princess in an arranged marriage, the prince tells the Little Mermaid he will not because he does not love the princess. He goes on to say he can only love the young woman from the temple, who he believes rescued him. It turns out that the princess from the neighboring kingdom is the temple girl, as she was sent to the temple for her education. The prince declares his love for her, and the royal wedding is announced at once. The mermaid sisters give the knife to The Little Mermaid. The prince and princess celebrate their new marriage on a wedding ship, and the Little Mermaid's heart breaks. She thinks of all that she has sacrificed and of all the pain she has endured for the prince. She despairs, thinking of the death that awaits her, but before dawn, her sisters rise out of the water and bring her a knife that the Sea Witch has given them in exchange for their long, beautiful hair. If the Little Mermaid kills the prince and lets his blood drip on her feet, she will become a mermaid once more, all of her suffering will end, and she will live out her full life in the ocean with her family. However, the Little Mermaid cannot bring herself to kill the sleeping prince lying with his new bride, and she throws the knife and herself off the ship into the water just as dawn breaks. Her body dissolves into foam, but instead of ceasing to exist, she feels the warm sun and discovers that she has turned into a luminous and ethereal earthbound spirit, a daughter of the air. 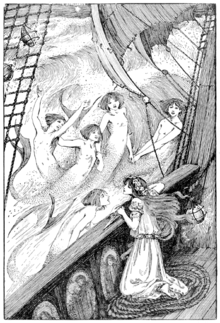 As the Little Mermaid ascends into the atmosphere, she is greeted by other daughters who tell her she has become like them because she strove with all her heart to obtain an immortal soul. Because of her selflessness, she is given the chance to earn her own soul by doing good deeds for mankind for 300 years, and will one day rise up into the Kingdom of God. "The Little Mermaid" was written in 1836 and first published by C.A. Reitzel in Copenhagen on 7 April 1837 in the first collection of Fairy Tales Told for Children. (Eventyr, fortalte for Børn. Første Samling. Tredie Hefte. 1837). The story was republished on 18 December 1849 as a part of Fairy Tales. 1850 (Eventyr. 1850) and again on 15 December 1862 as a part of the first volume of Fairy Tales and Stories. (Eventyr og Historier. Første Bind. 1862). The working title of the story was "Daughters of the Air," which are spirits who, as Andersen conceived them, can earn souls by doing three hundred years' worth of good deeds. At the end of the story, one of these spirits explains to the Little Mermaid that they do as many good things for humankind as they are able so that, at the end of those years, they can receive an immortal soul and "take part in the happiness of mankind." The spirits also explain that because the Little Mermaid refused to kill the Prince and has spent so much time in pain while still doing good things for man, the Little Mermaid has "raised [herself] to the spirit-world" and can participate in the three hundred years of good deeds alongside the Daughters of the Air. P. L. Travers, author of Mary Poppins and noted folklore commentator, wrote, "This final message is more frightening than any other presented in the tale. The story descends into the Victorian moral tales written for children to scare them into good behavior... Andersen, this is blackmail. And the children know it and say nothing. There's magnanimity for you." Andersen, however, felt that his revised conclusion in which the mermaid is empowered to attain an immortal soul through her own agency was a decided improvement over the original ending, which climaxed in the mermaid's dissolution. In 1837, Andersen wrote to a friend that, "I have not, like de la Motte Fouqué in Undine, allowed the mermaid's acquiring of an immortal soul to depend upon an alien creature, upon the love of a human being. I'm sure that's wrong! It would depend rather much on chance, wouldn't it? I won't accept that sort of thing in this world. I have permitted my mermaid to follow a more natural, more divine path." Other scholars like Jacob Bøggild and Pernille Heegaard notice the ending's shift away from tragedy as well. They point out that the events leading up to the mermaid's death should culminate in tragedy, but that the sudden twist allows the narrative to finish on a hopeful success. 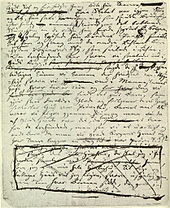 Bøggild and Heegaard argue that this disjointed ending was not the result of Anderson's sentimentality and religious beliefs, which have been attributed to his choice to stray from the tragic path he established in the rest of the narrative, but a conscious choice for ambiguity that stemmed from Anderson's skepticism towards idealized physical and religious symbols. In Maria Tatar's The Annotated Classic Fairy Tales, the transformation of the little mermaid from sea creature to mermaid in human form, and then to a creature of the air, is believed to reflect Andersen's constant engagement with mutability and changes in identity. Tatar also suggests that the Little Mermaid did not give up everything for love alone. Tatar's interpretation of the tale is one that presents a rare heroine with investigative curiosity which is shown through the mermaid's fascination of the unknown, the forbidden, and her intent on broadening her horizons from the start. Even before she sees the prince, she displays an intense longing to visit the world above the sea through her actions such as: arranging the flowers in her garden into the shape of the sun, listening to her grandmother and sisters' stories of the surface, and peeking in through the window of the prince's cabin during his birthday celebrations. Tatar argues that the mermaid wants, above all, to explore the world and discover things that are beyond what she already knows. The world above seems larger than her own and holds a greater range of possibilities to exercise her adventurous spirit. This is demonstrated in some versions of the story when the prince has a page boy's costume made for her so that she may ride on horseback and explore the land with him. Here, her willingness to cross-dress implies a willingness to transgress gender boundaries and take risks to be able to see the world. Tatar feels this also comments on Andersen's interests in changes in identity. In her analysis, Virginia Borges concludes that the story contains a message about love and self-sacrifice, and the dangers of accepting abuse or inconsiderate treatment in the name of love. Susan White interprets the story as the difficult liminal passage of the girl into the order of speech and social symbolism (power, politics, and agency) which is symbolically understood as masculine. The artist Pen Dalton has made use of Laura Mulvey's interpretation of fetishism in art to link The Little Mermaid to the wearing of fetishistic clothes, and obsessive cosmetic surgery with masculine fears of loss. Rictor Norton, in My Dear Boy: Gay Love Letters through the Centuries, theorizes that The Little Mermaid was written as a love letter by Hans Christian Andersen to Edvard Collin. This is based on a letter Andersen wrote to Collin, upon hearing of Collin’s engagement to a young woman, around the same time that the Little Mermaid was written. Andersen wrote ”I languish for you as for a pretty Calabrian wench... my sentiments for you are those of a woman. The femininity of my nature and our friendship must remain a mystery.” Andersen also sent the original story to Collin. Norton interprets the correspondence as a declaration of Andersen's homosexual love for Collin, and describes The Little Mermaid as an allegory for Andersen's life. In 1958, NBC began airing a new television show titled Shirley Temple's Storybook, an American children's anthology series that was hosted and narrated by actress Shirley Temple. The series features adaptations of fairy tales like Mother Goose and other family-oriented stories performed by well-known actors. The first season of sixteen black-and-white and colored episodes aired on NBC between January 12, 1958 and December 21, 1958 as Shirley Temple's Storybook. Thirteen episodes of the first season re-ran on ABC beginning on January 12, 1959. The second season of twenty-five color episodes aired on NBC as The Shirley Temple Show between September 18, 1960 and July 16, 1961 in much the same format that it had under its original title. The show aired their adaptation of The Little Mermaid on 5 March 1951 as episode 22 during the show's second season. Perhaps the most popular and most widely known version is the 1989 Disney film. The Little Mermaid is a 1989 American animated musical fantasy romance film produced by Walt Disney Feature Animation and Walt Disney Pictures. Loosely based on the Danish fairy tale of the same name by Hans Christian Andersen, the 1989 Disney film tells the story of a mermaid princess named Ariel, who dreams of becoming human; after falling in love with a human prince named Eric. Written, produced, and directed by Ron Clements and John Musker, with music by Alan Menken and Howard Ashman (who also served as a co-producer), the film features the voices of Jodi Benson, Christopher Daniel Barnes, and Pat Carroll among others. The Little Mermaid was originally planned as part of one of Walt Disney's earliest feature films, a proposed package film featuring vignettes of Hans Christian Andersen tales. Development started in the late 1930s, but was delayed due to various circumstances. In 1985, Ron Clements became interested in a film adaptation of The Little Mermaid while he was serving as a director on The Great Mouse Detective (1986). Clements discovered the Hans Christian Andersen fairy tale while browsing through a bookstore. Believing the story provided an "ideal basis" for an animated feature film and keen on creating a film that took place underwater, Clements wrote and presented a two-page treatment of Mermaid to Disney CEO Jeffrey Katzenberg who approved of the idea for possible development the next day. While in production in the 1980s, the staff found, by chance, original story and visual development work done by Kay Nielsen for Disney's proposed 1930s Andersen feature. Many of the changes made by the staff in the 1930s to Hans Christian Andersen's original story were coincidentally the same as the changes made by Disney writers in the 1980s. 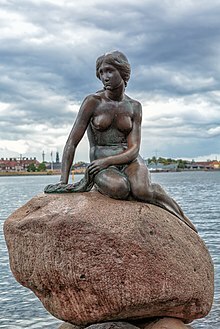 A statue of The Little Mermaid sits on a rock in the Copenhagen harbor in Langelinie. This small and unimposing statue is a Copenhagen icon and a major tourist attraction. The statue was commissioned in 1909 by Carl Jacobsen, son of the founder of Carlsberg, after he had been fascinated by a ballet based on the fairy tale. The sculptor Edward Eriksen created the statue, which was unveiled on 23 August 1913. His wife, Eline Eriksen, was the model for the body. Ellen Price, the ballerina who danced the Little Mermaid in the 1909 Royal Danish Ballet production, was the model for the head and face. The statue has been severely vandalized several times. In May 2010, it was moved from its Copenhagen harbor emplacement for the first time ever, for transport to Expo 2010 in Shanghai, where it remained until 20 November 2010. Some statues similar to The Little Mermaid are In Sicily. The first it placed in 1962 on the seafront in Giardini Naxos, and measures about four meters high over a fountain. A second always portraying a mermaid Post on a depth of sea about 18 meters. Inside the Marine Protected Area of Plemmiro of Siracusa. A third The Little Mermaid'statue is placed in Stresa in Piedmont. ^ "Hans Christian Andersen: The Little Mermaid". The Hans Christian Andersen Centre. University of Southern Denmark Department for the Study of Culture. Archived from the original on 30 April 2016. ^ a b "Annotations for Little Mermaid". SurLaLune Fairy Tales. Archived from the original on 1 July 2014. ^ "The Little Mermaid". SurLaLune Fairy Tales. 2005. Retrieved 9 February 2017. ^ Altmann, Anna E.; DeVos, Gail (2001). Tales, Then and Now: More Folktales As Literary Fictions for Young Adults. Libraries Unlimited. p. 179. ISBN 1-56308-831-2. ^ Frank, Jefferey (2005). The Stories of Hans Christian Andersen: A New Translation from the Danish. Raleigh, NC: Duke University Press. p. 104. ISBN 978-0822336938. ^ "Summary of Jacob Bøggild & Pernille Heegaard: "H. C. Andersens 'Den lille Havfrue' - om tvistigheder og tvetydigheder" ["Ambiguity in Hans Christian Andersen's 'The Little Mermaid'"]". The Hans Christian Andersen Centre. University of Southern Denmark, Institute of Literature, Media and Cultural Studies. Archived from the original on 4 April 2016. ^ Tatar, Maria, The Annotated Classic Fairy Tales (New York, NY: W.W. Norton & Company, 2002), pp.308. ^ Tatar, Maria, The Annotated Classic Fairy Tales (New York, NY: W.W. Norton & Company, 2002), pp. 305,311,315,320,323. ^ Borges, Virginia, A Million Little Mermaids, article in Journal of Mythic Arts Summer 2007, webpage found 15 May 2007. ^ White, Susan. (1993) Split Skins, Female Agency and Bodily Mutilation in The Little Mermaid. In Collins, J & Radner, H (Eds. ), Film Theory Goes to the Movies. New York: Routledge. ^ Mulvey, L. (1973) Fears, Fantasies and the Male Unconscious or You Don't Know What is Happening, Do You Mr Jones? Spare Rib Magazine, reprinted in Laura Mulvey, 2007, "Visual and Other Pleasures"
^ Norton, Rictor (1998). My Dear Boy: Gay Love Letters through the Centuries. United States: Leyland Publications. ISBN 0943595711. ^ Scott, Vernon (12 January 1959). "Shirley's Show Proves to Be Just Too Costly". The Bend Bulletin. Retrieved 4 May 2010. ^ a b Musker, John (2006). Audio Commentary from The Little Mermaid: Platinum Edition[DVD]. Walt Disney Home Entertainment. ^ "Disney's animated zombies: How classic stories are lost in reinvention". salon.com. ^ a b "Making Of... The Little Mermaid Behind The Scenes". The 80s Movies Rewind. Fast-Rewind.com. 2009. Retrieved 20 June 2013. ^ "The Little Mermaid". web.archive.org. 28 November 1999. Retrieved 5 March 2019. ^ "Denmark may move Little Mermaid". BBC News. 30 March 2006. Archived from the original on 6 March 2016. ^ Yang, Jingzhong; Lu, Ming'ou (21 November 2010). "Copenhagen holds grand homecoming ceremony for Little Mermaid". Archived from the original on 30 November 2010. ^ RagusaNews (18 August 2011). "Visita dei sommozzatori iblei alla statua di una sirena". ragusanews.com. Retrieved 23 March 2018. Wikimedia Commons has media related to The Little Mermaid. This page was last edited on 26 April 2019, at 00:52 (UTC).